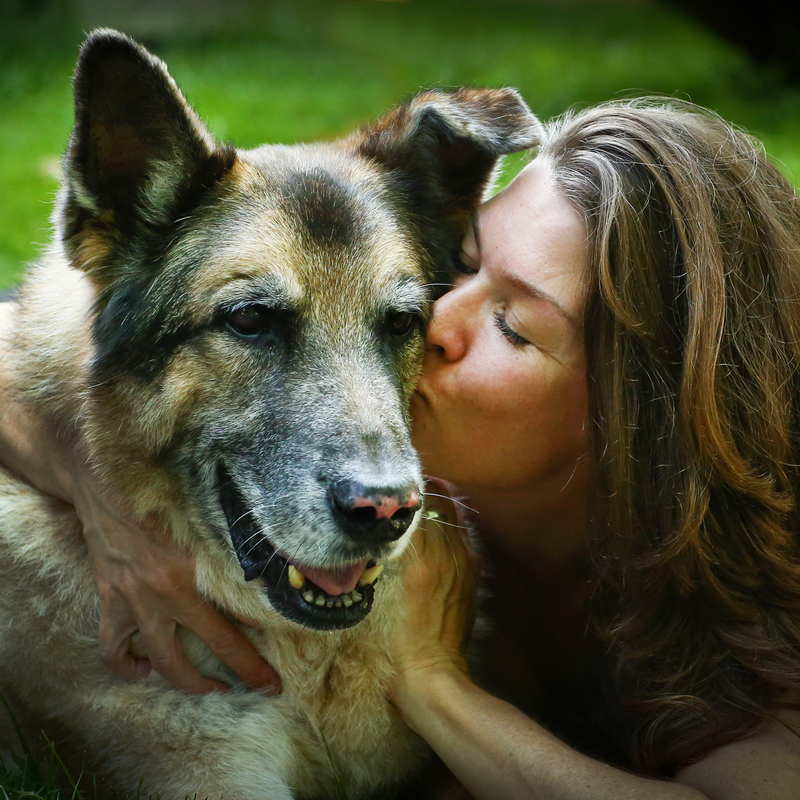 Burying my face in his thick, furry neck, I felt my dog take his very last breath. 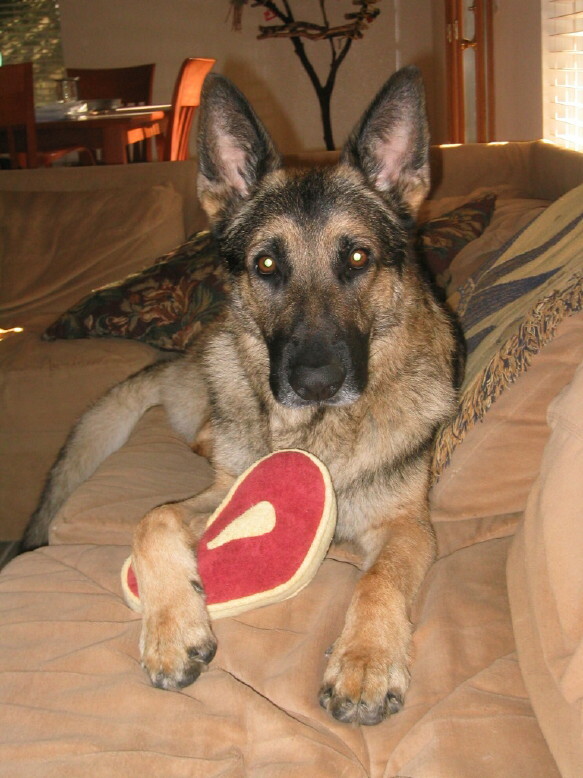 Hugo, my beautiful 14-year-old German shepherd, was gone. Lying with him in his bed, spooning his now motionless body, I sobbed with an intensity that shook me to the very core of my being. I realized I was crying harder than I had in years, my grief so deep and intense, it felt as if a part of me had been clawed out and torn away. Hugo was the first dog I’d raised from cradle to grave. I had had other dogs before him but what I felt for Hugo was different. 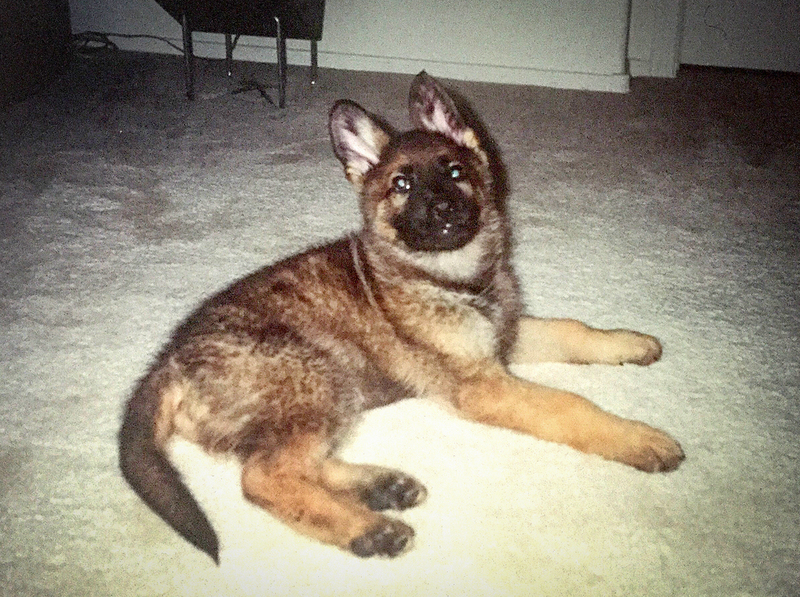 He was born the night my father died, so I liked to imagine that he’d been sent from a spiritual realm to serve as my protector and guardian, to be my “angel puppy.” But if anything, this special being in canine form came into my life to become one of my greatest teachers. A demanding puppy to raise, he was fear aggressive from an early age and became overly protective of me to a fault. I know I made a ton of mistakes with him. Yet in facing the challenges he presented I had no choice but to become a more patient, compassionate and understanding person, to work with his issues while accepting him for who he was – a wonderful but sometimes difficult dog. But despite his shortcomings that often tested my patience to its limit, Hugo was my baby boy and I was his mom, committed to him for life. Through our years together he saw me through some very difficult and tumultuous times. He was a constant, steady and unconditionally loving presence in my life, always there to lick away my tears and make me laugh with his silly personality. 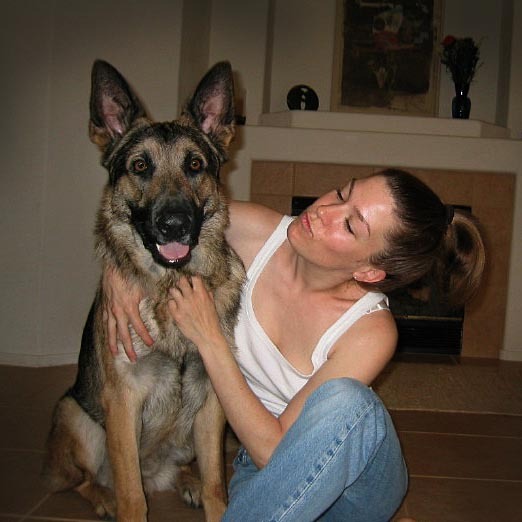 I adored him and kept him out of trouble and in return, he gave me his undying loyalty and devotion. I was his person, and as time passed our special connection only solidified. We understood and accepted each other, flaws and all. But now here I was, holding Hugo’s old, crippled body as it began to grow cold in my arms. I showered his grizzled head with tears and kisses, remembering when only 14 years ago I had taken that fuzzy little sable puppy in my arms for the first time, held him out in front of me and declared “he’s perfect!” Because he was. Baby Hugo at 9 weeks. Who would suspect that this adorable little bundle of joy was really a naughty little brat in disguise? As the vet took his leave and we waited for the pet crematory funeral director to arrive, it dawned on me that the depth of my sadness far surpassed anything I had felt when a human friend had died. In fact, I had just lost a close girlfriend the month before to cancer, and even though I had loved her dearly I certainly hadn’t felt this level of grief. Was there something wrong with me, or was I experiencing something akin to what one might feel when losing a child? Bewildered and curious about this phenomenon, I later consulted with my friend Betty Carmack, author of “Grieving the Death Of a Pet” and pet loss support group counselor at the San Francisco SPCA, a volunteer position she had recently retired from after 32 years. No, I wasn’t weird, she reassured me. In fact, my feelings were far from uncommon. A strapping young Hugo and his adoring Mommy. During the holiday season, I missed Hugo so terribly. I longed to be in his magnificent presence, to laugh at his silly antics, to feel those intense lion eyes watching my every move. Yes, I had my three other dogs to care for and adore, but the house wasn’t the same without my Hue. My husband, friends and family were so kind and understanding and I was surrounded by love, compassion and gestures of caring. Yet I ached. To make matters worse, a little nagging thought began clouding my mind: had I really done everything I could for my boy, who had suffered from terrible, debilitating arthritis in his last year? I thought I had followed every medical, natural and pharmaceutical protocol known to man, but was there something else I could have done that might have made him more comfortable or better yet, extended his life? Hugo showing his silly side. While I had enough support at home to help me through my grief, I could see the incredible value in joining a group like Betty’s to work through the rollercoaster of emotions I was experiencing. I felt so grateful I had people in my life who understood and could relate to my pain, imagining how terrible it would be if instead of sympathetic eyes and warm hugs I had been met with blank stares or even worse, comments like, “well, can’t you just go get another dog?” What would I have done then? Betty reminded me that while Western society has definitely come a long way when it comes to acknowledging the significance of losing a pet, there are still those who don’t understand how deep and intense that pain can be and as a result, may trivialize those feelings. Huey on his 4th birthday, protecting his new toy from the rest of the pack. Be compassionate, loving and gentle with yourself. You just experienced a major loss and have every right to be upset and to grieve, for as long as it takes to heal. Allow yourself to feel your emotions, the good, bad and ugly. Acknowledging your feelings will help you process the loss, so if you’re angry over your dog’s death, let yourself vent your frustrations. 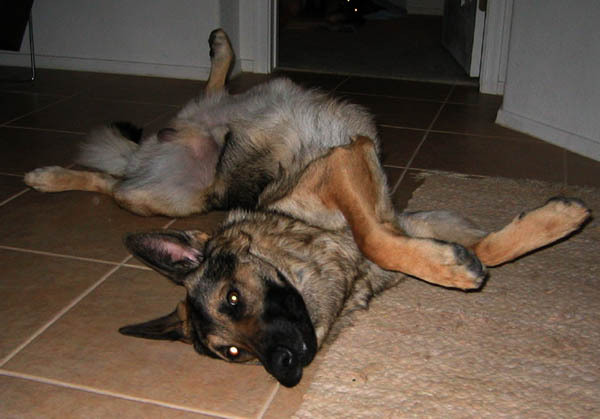 Memorials, rituals and tributes are great ways to honor your dog and work through your grief. Put together a photo album or scrapbook, journal about your dog, write poetry and songs, create a memory garden. Many pet crematories and cemeteries offer myriad services and products to help comfort pet owners, including online forums where people can make tributes, as well as beautiful urns, keepsakes and jewelry to hold pet remains. If you’re finding it difficult to move through your grief, consider finding a pet loss support group, online chat room or a counselor. You don’t have to go through this alone. There are numerous groups, hotlines, online sites and books available to help validate your feelings and guide you through your pain. Almost nine months later, I am still hurting over the loss of my Hugo but am finding ways to honor his memory and focus mostly on the good times we shared. Life without him hasn’t been easy, though. I still look for him in the house at times, thinking he’s right there next to me, eyeballing me for a treat, watching my every move, always at the ready to shower my face with kisses. His constant whining for my attention used to get on my nerves at times but now it’s like an old song I long to hear. And while I love my three fur kids beyond measure and know my life will always be filled with dogs, there will never be another like Baron Hugo Von Tollhaus, my angel puppy. To say he took a piece of my heart with him is an understatement. To me, he was a person in a dog suit, a special being who opened my heart as it has never been opened before. He was my teacher, my guardian, my child. Because of him, I am forever changed, and for the better. Hugo at 13 with his still-adoring Mommy. This entry was tagged loss of a pet. Bookmark the permalink. I lost my sweet Goby 3 days ago. This article helped put my feelings into words. I second guessed everything, I hurt deeper than I ever have, and I think my heart will ache forever. Like Hugo, Goby had eyes that followed my every move. I still feel her. This article makes me feel less crazy for my feelings and I wanted to thank you for writing it. Ditto… I had to put down my beloved 14 yo black lab, Blade, 4 days ago and I am so crushed I can barely breathe. I know it will get better with time, but thank you for putting into words how I am feeling. My yellow Lab , Sophie , didn’t quite make it to 9 , She had her spleen removed 6/25/15 and got a terminal prognosis of hemangiosarcoma . I had a healthy dog till 8/12/15′ . During the night , 4 am , she started acting distressed . We went out at 4:30am and she didn’t want to walk . I tried 3 more times and she was unsteady and collaspsing . I tried one more time with her harness on, to assist her, and she again laid down . My heart was breaking and I spent a half hour with her at the beach . I brought her to the Vet at 9:30 am where she devoured a bag of pill pockets and treats . I think I acted before any real pain came . Soph was gone at 10:50am and took my heart with her . It will be 10 months soon and I don’t have peace anymore . I had Heaven on Earth with her company, and now I’m emotionally empty . I’ve asked God many times to put me where I can be with my Sophie , I’m so ready ! A piece of Mommy with me. Landing softly on my muzzle. Still she lost me far too soon. I have crossed the threshold; she cannot come. Our hearts beat as one continually. Here I hold a broken piece of Mommy’s heart. What a beautiful remembrance of a beloved friend and companion. God took my precious baby boy, my lil’ spunky 15 year old terrier, a little more than a month ago and without suffering. God blessed and he was surrounded by family, held for hours in the arms of his mama who adored him. I miss him so very much and often it comes at me like a wave. I miss my truest friend. I have just lost my beloved , precious baby of 16 and a half years ——–I shall never recover from the loss——We /I are utterly heartbroken and grief stricken. I lost my Stella, a Jack Russell Terrier yesterday as I held her head in my hands and looked deeply into her eyes as I promised her that everything was going to be okay. As the needle did its job she threw up on my sleeve and even when the doctor said she had gone, I would wipe away the mess from around her mouth and I then went on to rub her warm and always hot belly that would have once kept me warm in winter time. I find it hard to trust people and at times I feel like I’m alone and at times I had thoughts of depression and suicide and she would always let me cry and sob into her fur because she was always the person that would be there for me no matter what. Who knows that maybe if I had taken her out to walk sooner than I would have whilst being lazy and watching tv extra then maybe she would of lived for longer or just something. I’m lost and alone without her. This article really helped me to understand the process of what I will go through.